Is Lumber Liquidators selling toxic laminate flooring? If you’ve recently installed laminate flooring from Lumber Liquidators in your home, you’re going to want to pay attention to this. 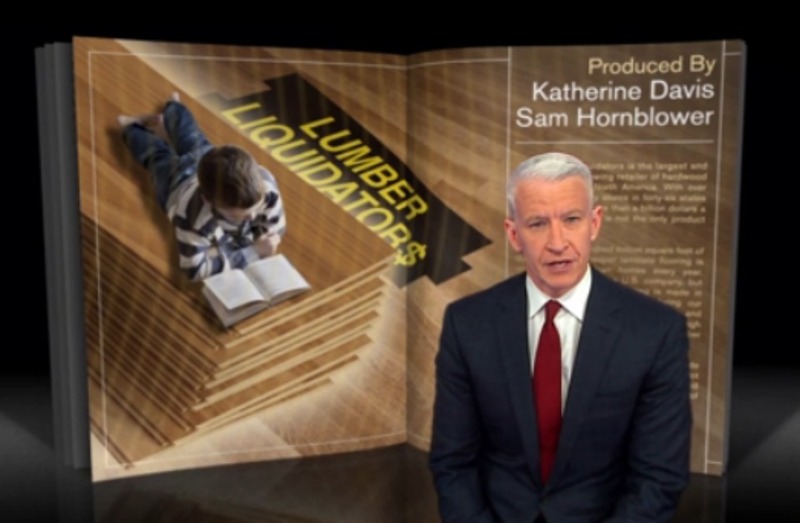 60 Minutes just aired a report that accuses Lumber Liquidators of selling Chinese laminate flooring that contains toxic levels of formaldehyde, a known environmental toxin linked to cheap glue used to bind wood particles together in the manufacturing process. Formaldehyde is a known carcinogen linked to myeloid leukemia and nasopharyngeal cancer as well as eye, nose and throat irritation. Lumber Liquidators sells 100 million square feet of laminate flooring that is installed in homes across America every year. And although not all the laminate flooring Lumber Liquidators sells is toxic — only the stuff made in China is dangerous — the two men behind the report, activist Denny Larson and attorney Richard Drury, estimate that hundreds of thousands of Americans are living with the dangerous flooring right now. Drury and Larson have filed a class action lawsuit seeking to have Lumber Liquidators replace the flooring of every person who unknowingly bought the toxic flooring. A company knowingly selling toxic products to Americans sounds unforgivable, but when you take a closer look, maybe this isn’t just a case of consumer advocacy. The efforts to test and release the levels of formaldehyde in the laminate floors was funded by a group of investors who, according to a statement from Lumber Liquidators on the 60 Minutes report, want to release the information to intentionally lower the stock price of the company. If that was the goal, it worked. The 60 Minutes report aired on Sunday, and by midday on Monday, the stock was down by 24 percent. Lumber Liquidators sold more than $1 billion worth of flooring in 2014. Financial analyst Jim Cramer says it will take “years” for Lumber Liquidators to recover from this terrible publicity. For its part, Lumber Liquidators refutes the claims made in the 60 Minutes report and released a statement to reassure skittish customers. Is the report a hysterical charge trumped up by investors to drive down the value of Lumber Liquidators’ business, or a real consumer threat? And should consumers have to wait and see how it all plays out in court? In the meantime, if you’re among the hundreds of thousands of households that recently installed laminate flooring from Lumber Liquidators, it might be time to check and see if it was from China. Your health might depend on it.